In order to see the activity of a carrot plant and the creative life forces forming it, imagine a tiny seed sprouting and growing into a lovely vermilion red, sweet, crisp carrot with green tops. Observe first the root of the carrot growing downward vertically around its center. Compared with its leaves it is dense with matter. The carrot tops on the other hand are drawn upwards towards the periphery, spreading out horizontally. They are lighter and slender with an almost lacy look. Already we notice two opposite, yet complementary, forces at work that qualitatively are completely different. One is the downward spiraling centripetal force which is often referred to as gravity and the other is the upward spiraling centrifugal force known as levity. Whereas the force of gravity is connected with the earth so is the force of levity connected with the cosmos. To really understand the essence of nutrition requires the courage to re-imagine the world and bring to our consciousness a view other than the purely material. Foods that are grown on farms where pesticides and herbicides have not been used for at least three years are referred to as organically grown foods. There are other requirements and regulations that follow specific guidelines (called NOP). It is a process at present overseen by the USDA and certified organizations. Organic foods are in high demand and now readily available in many big supermarkets. This demand has grown so much in the past decade that a real industry has developed around it. Many organic foods are today mass produced and grown in places where the cheapest labor can be found. Fortunately there are still a lot of local, small organic farmers who offer excellent quality foods. The most outstanding quality of food that I am familiar with is called biodynamic. Biodynamic grapes have won nation wide popularity for their excellent taste and aroma, producing fabulous wines. The quality of biodynamic is concerned with not only the environment that the food is grown in, but also with the qualitative processes in which the food is created. Cultures of the past, and perhaps some of our own grandparents, were aware that their crops received nourishment from the earth as well as the cosmos; the rhythmical cycles of the moon, sun and the stars. They worked the land according to their observations of these cycles and treated their animals, plants and soil in a way that reflected this relationship. 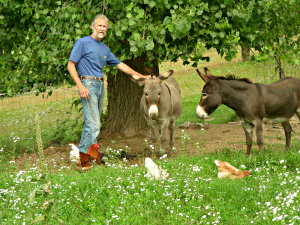 Biodynamic gardeners and farmers of today keep building on this respectful relationship. Biodynamic farmers experience their farms as individual, self-sustaining, living organisms that live and breathe with the earth in a sea of cosmic life forces. Everything is alive for the biodynamic farmer or gardener and maintains connection to the spiritual cosmic world. The farmer or gardener sees it as his or her responsibility to cultivate this connection. S/he prepares the soil in such a way that it enables plants to take up the cosmic influences necessary for their growth, using special biodynamic preparations. Scientist, artist and philosopher, Rudolf Steiner, inspired the use of these biodynamic preparations, which are made and used with the understanding of how the earthly and cosmic forces interact throughout the year. He recognized that the cosmic forces stream into the earth through the living nature of the elements as well as the soil, and its minerals. These cosmic forces support the plants in their growth. The quality and life forces of the plant we eat highly influences the quality of our thinking, feeling and interaction with people and nature. Our thinking, feeling and way of interacting create the future condition of our society and the world. Rudolf Steiner was aware that a renewal of agriculture is today necessary in order to reestablish the relationship between the cosmos and humanity, for the world. What distinguishes biodynamic farming from other healthy farming practices such as permaculture and organic farming is that biodynamic farmers consciously think and work in a practical way with these earthly and cosmic forces and rhythms. Sowing and harvesting are carefully done at the most favorable times in relationship to the sun, moon and planetary rhythms. In addition to working with the cosmic rhythms, applying biodynamic preparations and composted cow manure, these farmers also maintain healthy soil by rotating crops, incorporating plenty of organic matter into the soil and other holistic agricultural activities. Biodynamic farming practices are also regulated by certified organizations. In many areas of the world scientific research is carried out to develop a better understanding of the quality of biodynamic foods. Ideas are implemented, observations made, comparative testing done and elaborate evaluations made in search of future agriculture practices in harmony with the living world filled with spirit.